A real ale produced by a small Northern Ireland brewery has been judged one of the best 50 beers in the world. 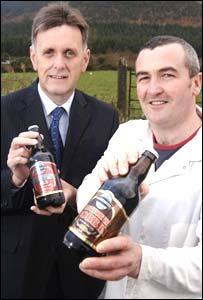 Whitewater Brewing Company at Kilkeel won the accolade in the prestigious International Beer Challenge 2007. The brewery's main product, Clotworthy Dobbin Ale, captured the attention of the judges who included beer critics, brewers, buyers and retailers. Its taste and packaging put it ahead of a host of international entries. The company employs just three people. It will now be in the running for the International Beer Challenge's Supreme Champion award which will be announced in London in October. The Whitewater Brewing Company was set up by brewer Bernard Sloan and his wife, Kerry, in 1997. Mr Sloan said: "Gaining a listing as one of the world's top 50 beers is a marvellous endorsement of the quality of our Clotworthy Dobbin Ale. "We set out to produce an ale that was different, that offered a fresh, crisp taste and we've succeeded by using only the best quality ingredients and traditional brewing techniques." Whitewater already numbers major retailers among its customers as well as many leading bars. Recently it gained a gold award in the UK Guild of Fine Food's Great Taste Awards for its Belfast Ale. Sales have grown by 30% over the past year and the company has made a substantial investment in the latest bottling technology - with the support of business development agency Invest Northern Ireland. The brewery now has the capacity to bottle up to 1,000 bottles an hour. Mr Sloan said: "The growth in demand for our products has led to the plant operating at full capacity and we are looking at on-site expansion options. Maynard Mawhinney, Invest NI's director of food, said it was a "tremendous accolade" for the brewery. "(It) shows that by focusing on quality and taste even the smallest Northern Ireland company can compete successfully with much bigger and longer established enterprises in the UK and from further afield," he said.